It is well known that a diet high in fat can trigger a metabolic syndrome, a group of symptoms that pose as risk factors for diabetes and heart disease. Scientists have now discovered that vitamin D deficiency is necessary for this syndrome to progress in mice, with underlying disturbances in gut bacteria. "Based on this study, we believe that keeping vitamin D levels high, either through sun exposure, diet or supplementation, is beneficial for prevention and treatment of metabolic syndrome," says Professor Stephen Pandol, at Cedars-Sinai Medical Center, USA, who collaborated with Yuan-Ping Han's research group at Sichuan University, China in the study. Metabolic syndrome affects nearly a quarter of the world's adult population, and it is defined by a group of risk factors that put you on the road to diabetes and heart disease. The characteristic symptoms include obesity around the waistline and at least two of the following: high blood sugar levels, high blood pressure or high cholesterol. Sufferers usually also have excess fat in their liver. The main cause of metabolic syndrome appears to be a diet high in fat or carbohydrate. However, observational studies have also linked metabolic syndrome to vitamin D deficiency, which affects 30-60% of the world's population. The research team made important advances in understanding the causative role of vitamin D in this syndrome. "A sufficient dietary vitamin D supplement can partially but significantly antagonize metabolic syndrome caused by high fat diet in mice," says Pandol. "These are amounts equivalent to the dietary recommendations for humans." More specifically, they have shown that a high fat diet affects the balance between good and bad bacteria in the gut. This induces modest fatty liver and slightly raises blood sugar levels in mice. Remarkably, an insufficient supply of vitamin D aggravates the imbalance in gut flora, contributing to full-scale fatty liver and metabolic syndrome. Vitamin D deficiency decreases the production of defensins, which are anti-microbial molecules essential to maintain healthy gut flora. As expected, an oral supply of a synthetic defensin recovers gut bacteria balance, decreases blood sugar levels and improves fatty liver. In summary, a high fat diet alone is not enough to cause metabolic syndrome but it is needed in combination with vitamin D deficiency. Accordingly, vitamin D supplementation improves metabolic syndrome in mice. The next step would be to validate the results in humans. 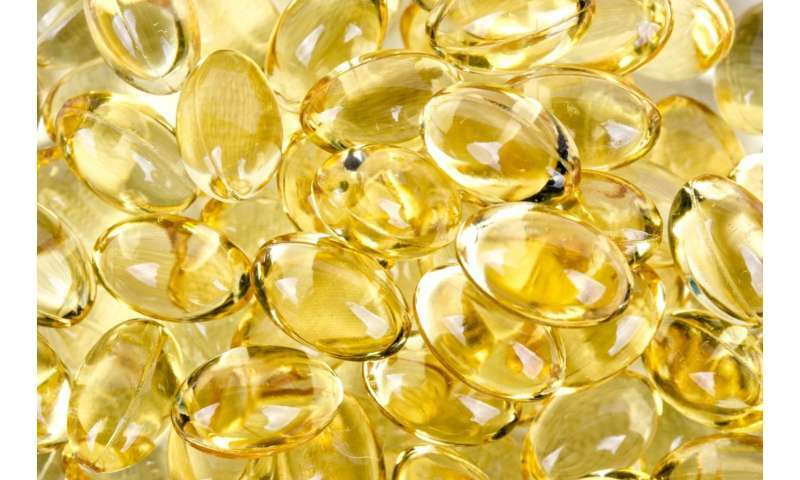 "Few studies have indicated that vitamin D supplementation may not improve metabolic disorders in humans. However, these studies are largely based on long-term surveys, which may be hampered by poor compliance and insufficient dosage," says Hans. He remains optimistic that the results of their study can be confirmed in humans. "We are planning a clinical study to confirm the link of vitamin D deficiency with gut bacteria disruption, and its association with metabolic syndrome," says Han. Studies with Vitamin D should use at least 10 000 IU of D3 daily (per person). Huge doses taken over time are unreliable as most Vitamin D is depleted after roughly 2 weeks, not 3, and certainly not 4. The RDA has been grossly miscalculated and in peer-review found that it's supposed to be closer to 10 000 IU per day... not 1000 IU or 2000 IU.